After many weeks to possibly months of knowing about it, I broke down yesterday morning and decided to crash Barcamp Mobile. A few of my local Twitter friends were actually putting it on and quite a few more were attending. However, since it's a "user-led conference" (meaning that the attendees are actually the speakers and presenters) I was freaking out about going. Shortly after breakfast, the urge to go was overwhelming. So I checked with a few friends who were there to see if it was okay for me to just show up, and did. It was a super relaxed atmosphere and there were a variety of topics being discussed and presented. While some topics were geek/tech related, others were just generally interesting (like "How to Fry Anything" and "Genealogy.") All in all, it was a pretty good time. I might even come up with a presentation for next year. . .maybe. While I should have gotten some macro shots of the fried mini Reese's, kool-aid, and Oreos; I was too busy consuming them to worry with my camera and greasy fingers! 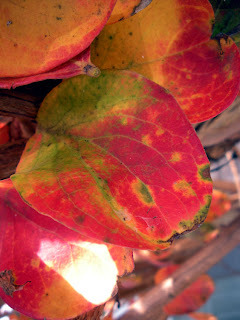 Instead, let me show off the pretty colors that the leaves on my Crepe Myrtle have turned. 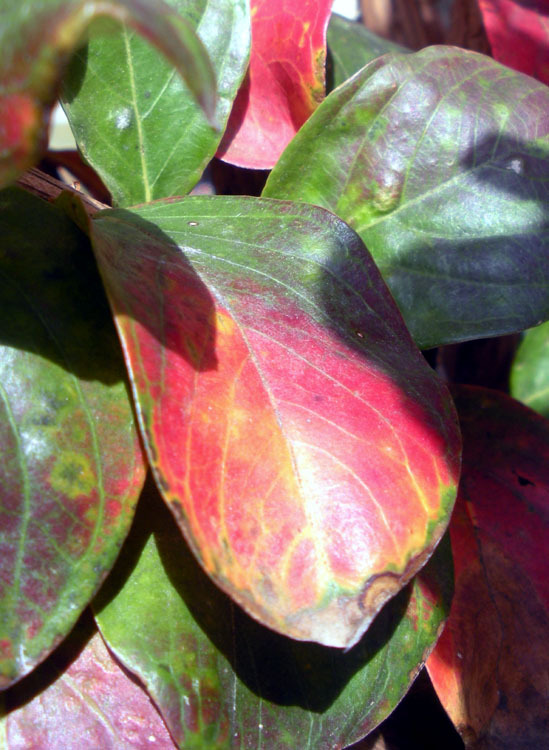 We don't get too many pretty leaves in Autumn down here. Most of the trees just stay green or instantly turn brown. So, the variety of colors right outside my front door makes me smile a little. 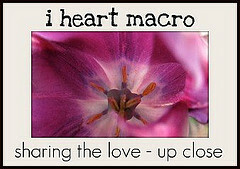 See more I Heart Macro shots with Lori at Studio Waterstone. Before I go, let me share some more pretty autumn hues with you. Here's hoping you enjoy what's left of the weekend. Barcamp certainly was a good experience. It was a lot of fun to see the more sociable of our mostly unsociable segment of the population (geeks & nerds). I'm already talking to some Pensacolians to see if we can get one going over here. Maybe late winter/early spring. Definitely. I hate that it took me so freakin' long to decide to attend and then missed most of it. Ah well. . .I learned my lesson the hard way (as always.) I guess that means that I'm right down the middle when it comes to my social-ness. For some reason I thought P'cola already had a Barcamp. I guess I was mistaken. I'm sure Sara can give you lots of tips on how to get it going!! Best of luck and keep us updated. Good for you for doing something you really wanted to! 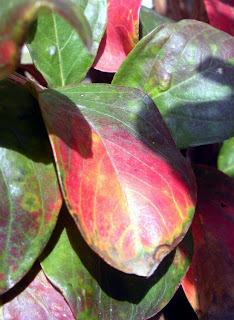 The leaves are almost as pretty as the flowers. Kind of extends the beauty of the tree for a little longer. Wow you are very talented! Hope, so often we are afraid of the unknown, but once we step out there and attend, we have a tendency to say "What was I so scared of?" I'm so guilty of this very thing. I'm glad you went and had a good time. I need to check to see if there is anything like this in Montgomery. 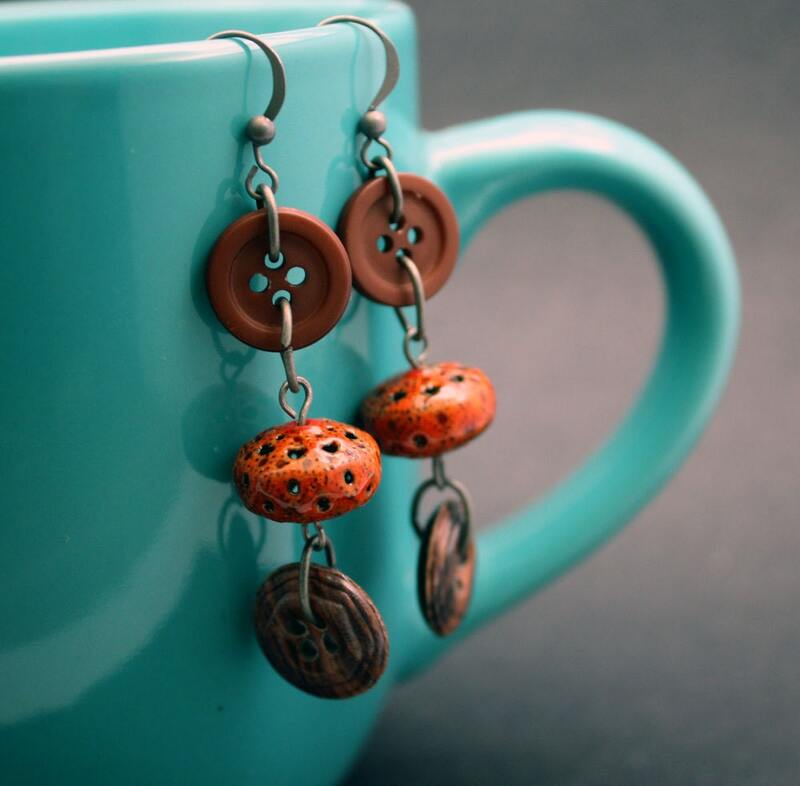 Love the earrings. Kim! Thanks so much. I really appreciate that. Well you get out waaay more then me lol I saw fried Koolaid on the Food Network - is it as scary as I think it is?? ?